The Byzantine army had been strongly influenced by the Turkic Avars. Although Byzantine armies seem to have included four times as many infantry as cavalry, the most important tactical roles still lay with theme cavalry, even in defensive guerrilla-style warfare. Horse-archery had remained relatively unimportant since the 9th century, probably because heavy cavalry was easier to train. Consequently light infantry and heavy cavalry formed the bulk of mid 11th century Byzantine forces, the heavy cavalry perhaps providing prototypes for the medieval European knight. There is some evidence that the Byzantine heavily-armoured cavalryman was in turn at least partially a product of military influence from those central Islamic lands which had inherited the armoured cavalry traditions of pre-Islamic Iran. Horse-archery, meanwhile, seems largely to have become the preserve of allied or mercenary troops of non-Byzantine and usually Turkic origin. These were organized into separate though clearly important units of mounted archers. Although they continued to make effective use of both shock and missile infantry, the Byzantines turned to theme cavalry. After an extended period of dependence on Teutonic and Hunnish mercenary cavalry, the reforms of the emperors Maurice and Heraclius in the 6th and 7th centuries developed an effective provincial militia based on the institution of pronoia, the award of nonhereditary grants of land capable of supporting an armoured horse archer called a cataphract. Pronoia, which formed the core of the Byzantine army’s strength during the period of its greatest efficiency in the 8th through 10th centuries, entailed the adoption of the Hunnish composite recurved bow by native troopers. 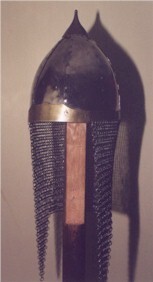 The Byzantine cataphract ware armed with bow, lance, sword, and dagger; he wore a shirt of mail or scale armour and an iron helm and carried a small, round, ironbound shield of wood that could be strapped to the forearm or slung from the waist.The foreheads and breasts of officers’ horses and those of men in the front rank were protected with frontlets and poitrels of iron. The militia cataphracts were backed by units of similarly armed regulars and mercenary regiments of Teutonic heavy shock cavalry of the imperial guard. Mercenary horse archers from the steppe continued to be used as light cavalry. 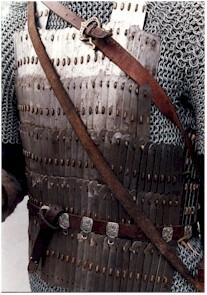 Here is a close up of lamellar armor, as you can see it is more complex than regular chain mail. The Kataphraktoi described in the Praecepta Militaria were to wear helms with 2 or 3 layer mail hangings covering all but thier eyes, klibania with splinted upper sleeves, lower sleeves and skirts of padding faced with mail, and splinted grieves. Such panoply undoubtedly survived into the twelfth century, but along side it some innovations were to be seen. A very few of these innovations were influenced by the West, such as the mail chausses, and the use of kite shields. Emperor Manuel I Komnenos is credited with introducing Frankish cavalry methods to the Byzantine army, specifically mentioning the replacement of round shields with kite shields. Greater wealth allowed the more extensive use of lamellar, as in these iverted lamellar sleeves and skirts, which might be considerably longer than here. Lamellar is one of the forms of armour most misunderstood in the popular militaria field, and this observation is most particularly true of Byzantine lamellar. 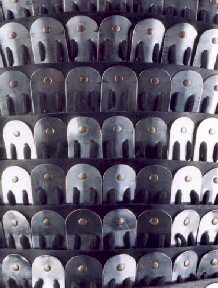 Prior to the tenth century Byzantine lamellar underwent a technological innovation, which sets it apart from the sorts of lamellar used by other cultures.The plates of middle Byzantine lamellar were fixed not to the plate adjacent in the row, but to a backing. Originally this was done by lacing, but from around 1000 c.e. it was done by rivetting as illustrated here. The “Phrygian cap” helm was a fashion that appears in Byzantine sources in the eleventh century, and became very widespread in the twelfth century across cultural and religious boundaries. The high European war saddle did begin to be adopted along with other Western cavalry methods, but did not become prevalent until the thirteenth century. 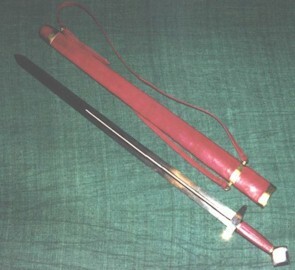 The common sword used by Cataphracts or other Byzantine cavalry was the spathion, but Spears or lances, were the main weapon of choice for Byzantine Cavalry. So if you fond of medieval stuff you should try themed free pokies or Total War Game which will bring you the atmosphere and detailed view of past times.